It’s nice when someone thinks that you have had a good idea, but even better when they have the means and motivation to turn your good idea into reality. At some point last year I suggested to Robin Davis that a class on how to make your own bacon would be interesting. I think this was in the after-glow of bacon camp, when it seemed that everyone had gone bacon mad. 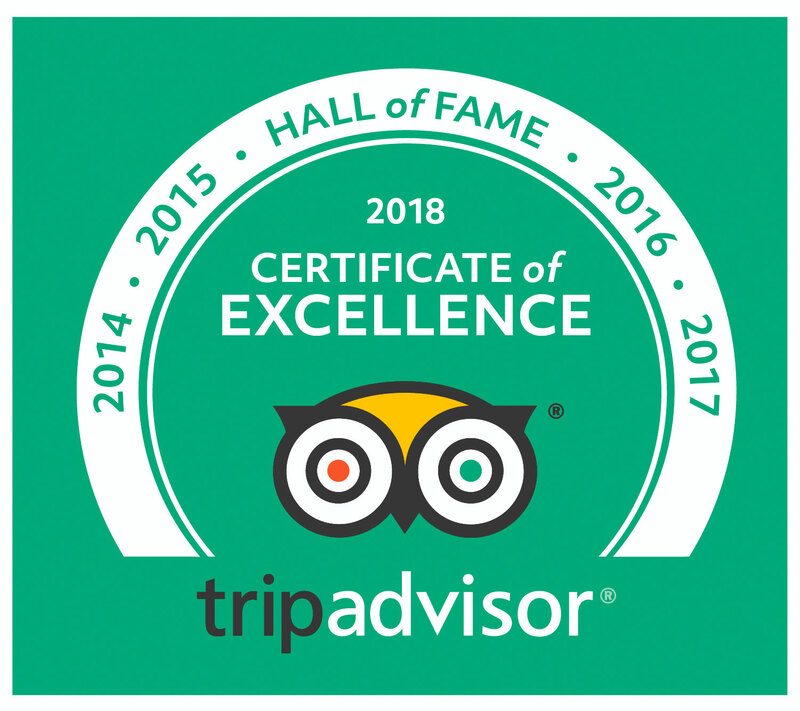 I had heard that Adam Welly of Wayward Seed Farm was an expert-home-charcuterer (if that is a word) and Robin, being the make-it-happen woman that she is, made it happen. 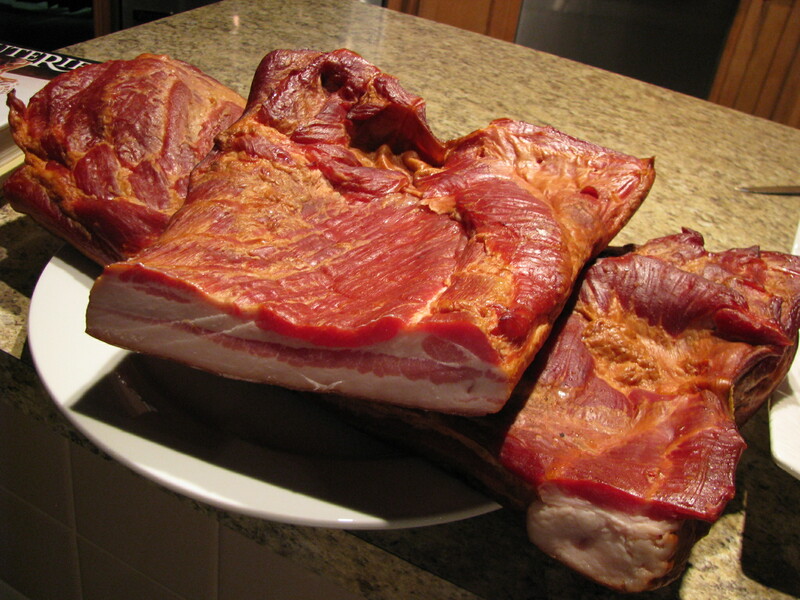 We learned how to make two different types of bacon: Canadian bacon and pancetta, chosen because Adam felt that these were the most achievable to start with at home, but we also were able to try some other types of bacon that Adam had cured. Adam was a great teacher, with an endless stream of advice and at times Macguyver-ish practical tips, very reassuring and willing and able to answer any question thrown at him. Here’s one of the handy tips: If you need to slice slab bacon yourself, because really, who has the luxury of a meat slicer at home? Put it in the freezer for 10-15 minutes and then it is much easier to get thin slices. Adam also gave us a reading list: Harold McGee On Food and Cooking (1984 and 2004), Michael Ruhlman and Brian Polcyn Charcuterie (2005) and Paul Bertolli Cooking by Hand (2003), as well as some Bacon making suppliers Butcher and Packer Supply Company and The Sausage Maker Inc. In between explanations of the various stages involved in making Canadian bacon and pancetta we enjoyed a four course pork feast. 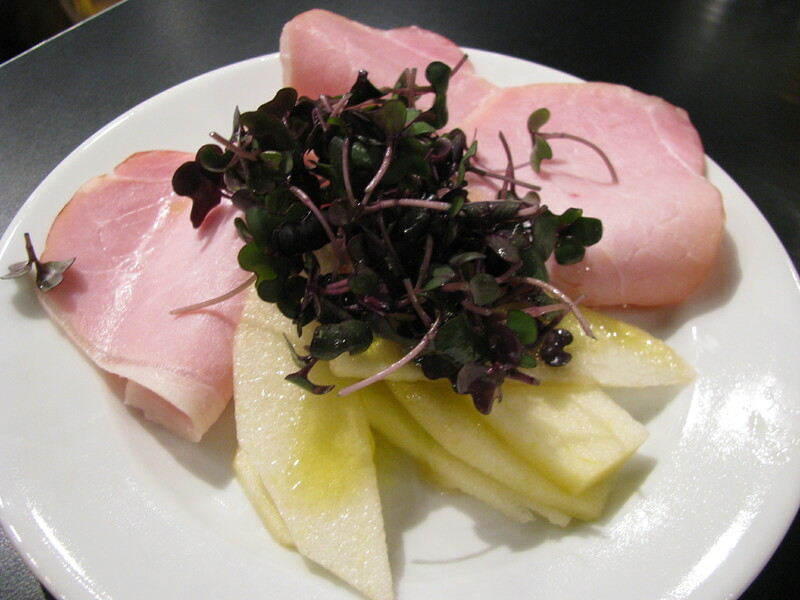 We started off with some of the Canadian bacon served cold with sliced Fuji apples, Wayward Seed Farm’s micro red cabbage greens and a simple but luxurious salad dressing of champagne vinegar and a buttery French olive oil. 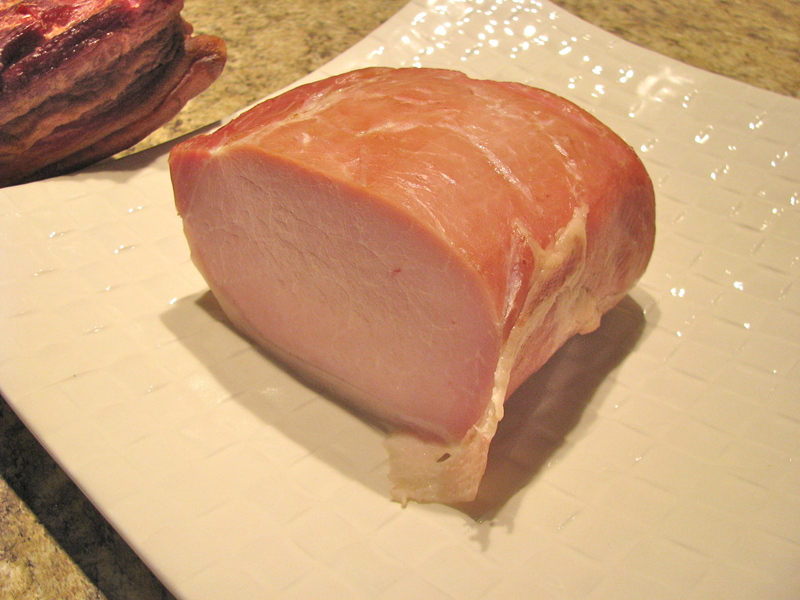 The Canadian bacon was unsmoked and succulent. 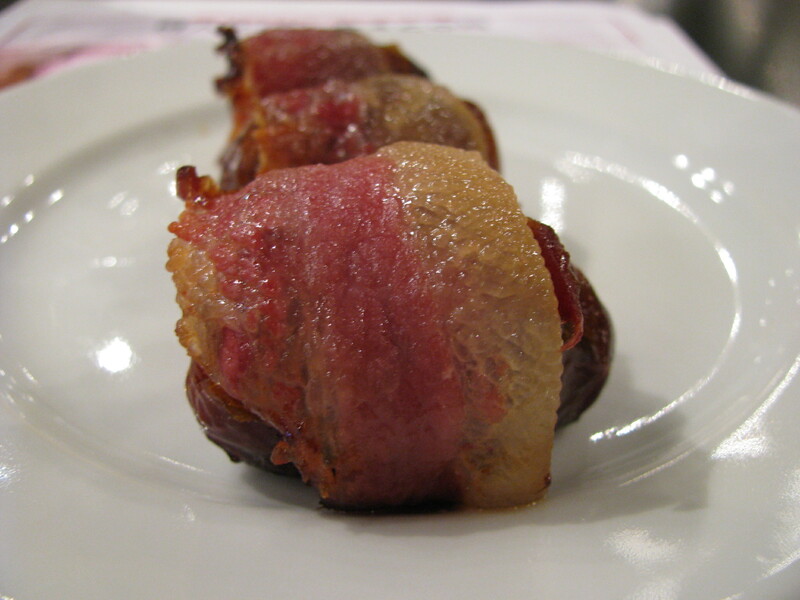 Next were some medjool dates wrapped in thinly sliced jowl bacon. 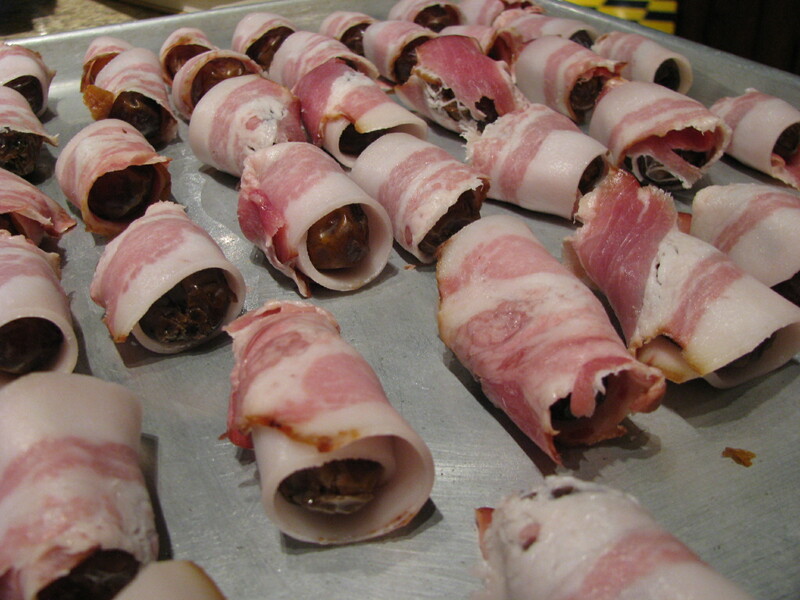 I have had dates wrapped in bacon (or devils-on-horseback as they are sometimes known), before but these really were the best ever. The bacon was superb and using the large juicy medjool dates really makes a difference. 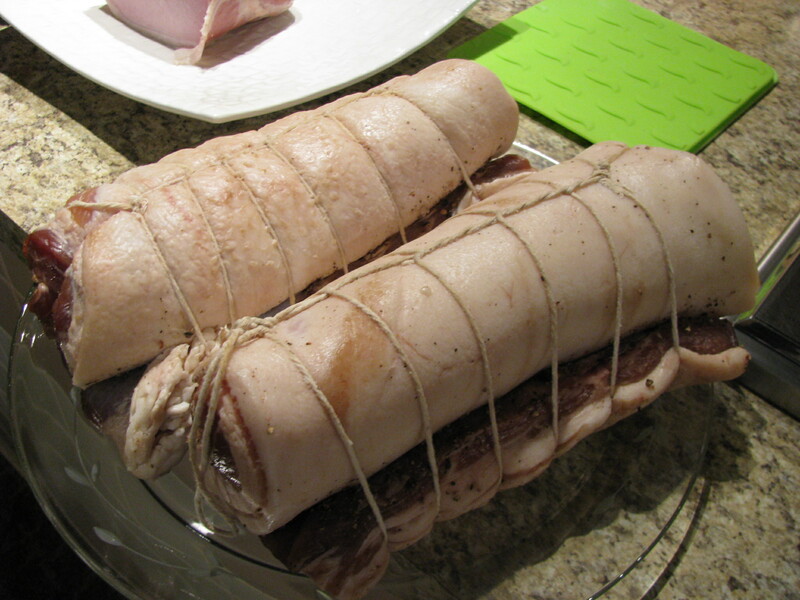 To make them at home wrap the dates in a thin slice of jowl bacon, or half a slice of slab bacon. Place them on a baking sheet in a preheated oven at 375º for about half an hour. Hard as it may be to resist, let them cool a little before you eat them as they come out of the oven molten hot. 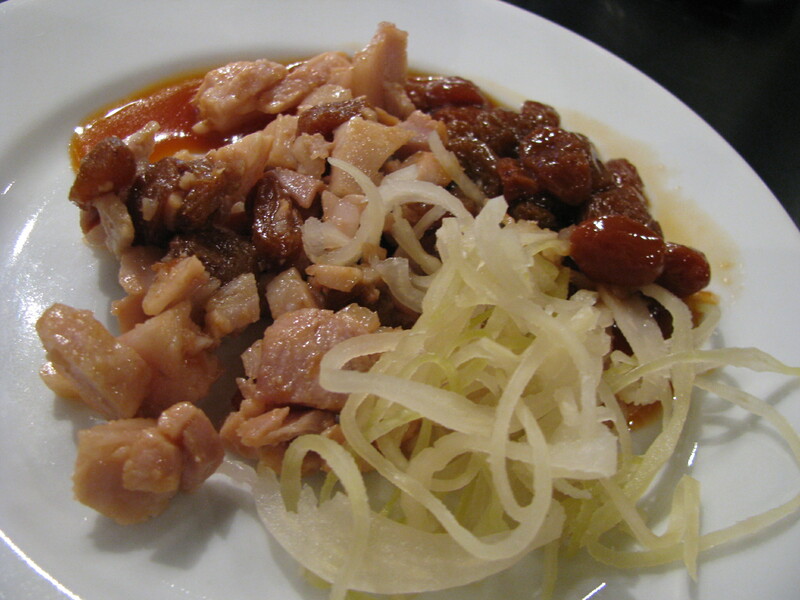 The third course was some pork rilettes served with Adam’s homemade sauerkraut and a gastrique of golden raisins soaked overnight in tangerine juice and then cooked down until reduced to a chutney like consistency. This gastrique would go well with all sorts of cold meats. For dessert I would have been happy with more of the bacon wrapped dates, but another treat was in store: Jeni’s salty caramel ice cream topped with a slice of candied bacon. 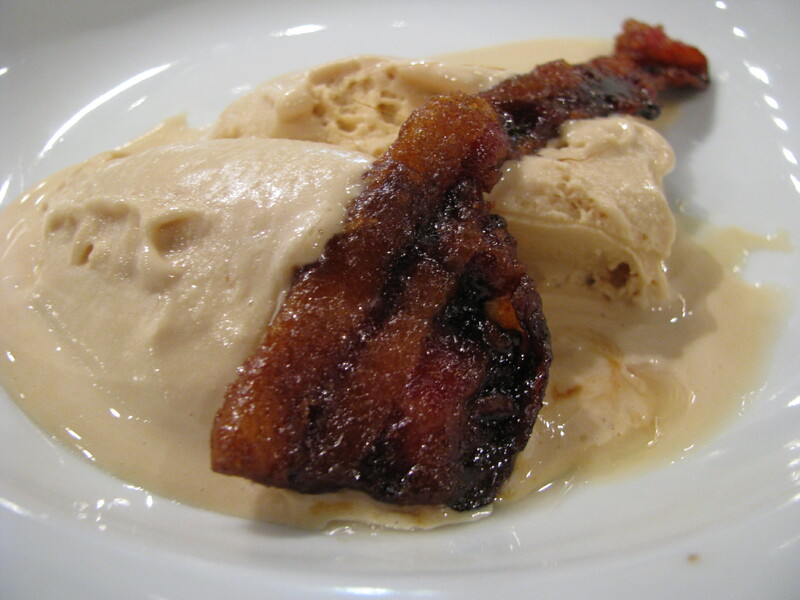 To make candied bacon at home, dip a slice of bacon in brown sugar and then bake in the oven. You will need to use baking parchment, a silicon mat or a baking rack. We learned that they can be rather adhesive! Making bacon requires a lot of patience, whilst the steps seemed fairly straightforward, there is a lot of waiting between each stage. Not being a particularly patient person, I may not attempt making my own bacon any time soon, but I certainly gained more understanding and appreciation of the process and the amount of time and work that goes into producing one of my favorite foods. 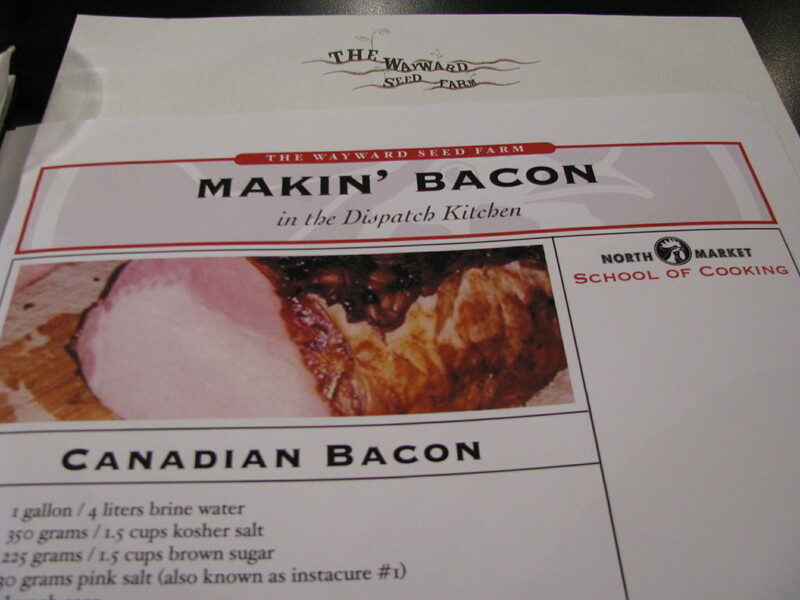 One thing I realized after the class – We never did get to try the pancetta and it should be ready by now! Maybe I will have to make my own. I was curious and now I know, too!